Located on beautiful Fairmount West Avenue, this newly built co-working space offers a professional, modern, unique and welcoming environment. The 2 000 square-ft. space encompasses 4 closed offices, 5 dedicated work stations, a conference room, a kitchen and an event space. Mile end is ranked one of the coolest neighbourhoods in the world, with its architectural wonders, proximity to Mont-Royal park, independent businesses as well as its cultural and artistic diversity. At L’Espace Mile End, we offer many office spaces options (closed, shared, floating) and the possibility of renting a meeting room. Lounging space, kitchenette and picnic table on the terrasse. Not available - Write to us to put you on our waiting list. Ideal space for work meetings, sales negotiations, interviews, sales pitches and private phone calls. Art lover, the founder of Espace Mile End launched in 2018 the contest Exposez-vous to support local artists. They benefit an exhibition wall and a vernissage which is open to the public. These quarterly exhibitions allow its members to work in an inspiring and colorful environment. Exhibition visits are by appointment only. In this exhibition, the painter Muriel Jaouich tries to honor the memory of the family members who survived and perished in the Armenian genocide in 1914. Through a series of paintings, she expresses the memory persistence differentiated and subject to the temporality that sees witnesses disappear. She is guided by the impact of the intergenerational trauma of her genealogy in her work. In attempting to emulate the vulnerability of the psyche and the body, Jaouich's works take on an ephemeral life, animated by an invisible psychological impulse. Simon Bertrand du mouvement international Extinction Rebellion. Samedi le 9 février de 19h à 20h30. Gratuit à Espace Mile End. Filmmaker in residency at Espace Mile End. You’d like to visit the space or have a free trial day before joining us? Our manager will gladly answer any questions in the shortest time! ESPACE MILE END OFFRE UN ESPACE SOCIAL CONVIVIAL POUR LES PROFESSIONNELS, ÉTUDIANTS, ENTREPRENEURS ET TRAVAiLLEURS AUTONOMES. 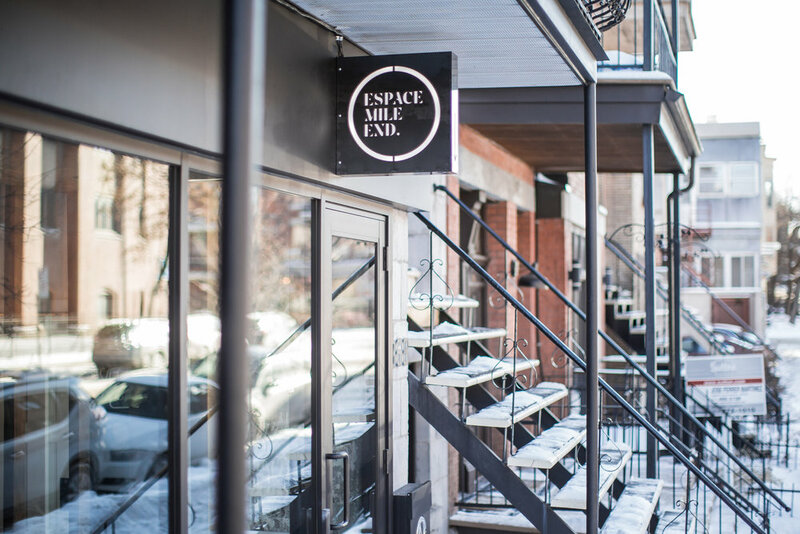 ESPACE MILE END OFFERS A CONVIVIAL SOCIAL SPACE FOR PROFESSIONALS, STUDENTS, ENTREPRENEURS AND SELF-EMPLOYED WORKERS.